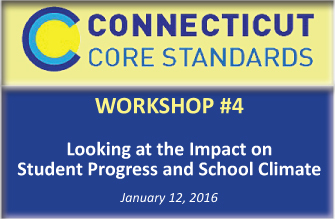 The Connecticut Standards for Professional Learning were designed to support excellence in teaching and learning through high-quality professional learning for educators. More than three decades of research in the professional learning field served as the foundation of the Connecticut Standards for Professional Learning. The research-base includes the Standards for Professional Learning originally developed in 1995. Learning Forward convened a broadly representative stakeholder group to develop these standards to reflect successful practices and define high-quality professional learning. This site has not been updated since 2013, but still contains materials relevant to conducting and monitoring data teams. The Common Core State Standards expect students to use evidence from texts to present careful analyses, well-defended claims, and clear information. A central tool to help students develop these skills is text-dependent questions: questions that can only be answered by referring back to the text. On this webpage, teachers can find tools to help write and evaluate text-dependent questions, as well as a link to lesson materials with examples of text-dependent questions included. This collection includes tools to help with each step and research to support teachers’ understanding of text complexity. Learning Forward shows you how to plan, implement, and measure high-quality professional learning so you and your team can achieve success with your system, your school, and your students. Fees apply to non-members for some resources. Through the Standards for Professional Learning, Learning Forward leads the field in understanding what links professional learning to improved student achievement. Bloom’s Cognitive Process Dimensions – This chart applies Webb’s depth-of-knowledge (DOK) levels to Bloom’s cognitive process dimensions – for MATH and SCIENCE. Looking at Student Work: Building in the Habit of Looking at Equity – This document is a printable PDF file. The first step in a great lesson is a “Do Now”– a short activity that you have written on the board or that is waiting for students as they enter. The Do Now is independent work that students do as soon as they enter your classroom- before the lesson begins. Can be used as a quick and efficient formative assessment.